With approximately 2 billion people active on social media around the world, it’s a marketing channel most small and medium-sized businesses (SMBs) cannot afford to ignore. In this post, we explain why it can be effective and which platforms are best for your business. Most marketers would tell you that not having a social media presence in today’s age is bad for business. While every new technology (even the telephone) has its skeptics, there’s no denying that social media has a huge foothold. With approximately 2 billion people active on social media around the world, it’s a marketing channel most small and medium-sized businesses (SMBs) cannot afford to ignore. Whether you are a new or established business, you should consider building your social media presence. In this post, we explain why it can be effective and which platforms are best for your business. Before getting started on social media, it’s crucial to determine who your customers are, as this can dictate which social networking sites you should focus your efforts on. First, are you selling your product or service to other businesses (business-to-business marketing, or B2B) or to individual customers (business-to-consumer marketing, or B2C)? If you are selling software to other businesses, for instance, your social media audience is like-minded business people, who you will not likely find on Instagram. Your tone for B2B marketing should be more formal and informative, as purchases are made based on perceived return on investment. In contrast, you’ll be more successful marketing to the masses with shorter messages and a more casual tone. Consumers make purchases based on emotions, so focus on the benefits of your product or service to them. Customer demographics are important to know as well. For instance, if your business targets a millennial audience, you might use social platforms such as Instagram and Snapchat, which appeal to younger audiences. Or, if your target market is mainly women, you should build your presence on Pinterest, whose user base is predominately female. Simply put, when it comes to building your social media presence, go where your customers are. Does Social Media Marketing Increase Sales? There is a range of opinions on whether social media marketing can drive sales and increase revenue. The short answer is that it can, when done properly. Some SMBs give social media a tentative try, but rein in their efforts if they don’t see immediate results. Others put all of their marketing efforts into social media, which is equally misguided. Instead, social media should be one among many of your SMB’s digital marketing activities (including email, pay per click, or affiliate marketing). Admittedly, it can be harder to extract sales from social media than from other channels and difficult to determine the return on investment, but its many benefits make social media marketing worthy of investment. Social media marketing goes beyond simply advertising. Social networking is one of many ways to reach your target market, but it’s more multi-faceted than other advertising strategies (such as print ads or television commercials) and gives you a more direct link to your customers. Increase brand recognition: As you build your business, you can also build your brand on social media. Develop a consistent tone and style in accordance with the product or service you are offering (for instance, a tax preparation service should have a more professional tone than an event planning business), and use it across all of your marketing channels. Your posts will potentially be seen by many sets of eyes, so use your social pages as a voice for your brand. Build relationships: In 2015, 65% of American adults were active on social media.Consequently, you will find many, if not most, of your customers on social networking sites. In contrast to television or print ads, social networking allows you to connect directly with your customers and get to know them. It allows for a personal touch and gives you the opportunity to engage with current customers and generate new leads. Reach the masses: Social media is particularly useful if you need to circulate real-time information, such as notifying users that your website is down, reminding customers about your holiday hours, or announcing a surprise sale. Provide customer service: Where customers used to phone or write a letter to a business when they had a complaint, compliment, or question, they are increasingly turning to social media to communicate with businesses. Why? Simply put, it’s easy to do and the response is often immediate. The benefit to you is that a satisfied customer is likely to share their positive social media experiences with their own network. Get feedback: By its nature, social media promotes two-way communication. Customers may use social media to engage with you or to learn more about your business and brand, but you can do the same. Conduct surveys or polls to get their feedback, ask them for ideas, or even reach out to other business owners to ask for advice. Pro Tip: Not all customers will direct their feedback to your social pages, so it’s important to find and track your brand mentions to determine how customers perceive your brand and to identify issues they are having. Drive traffic: Both online businesses and brick-and-mortar retailers can use social media to increase traffic. 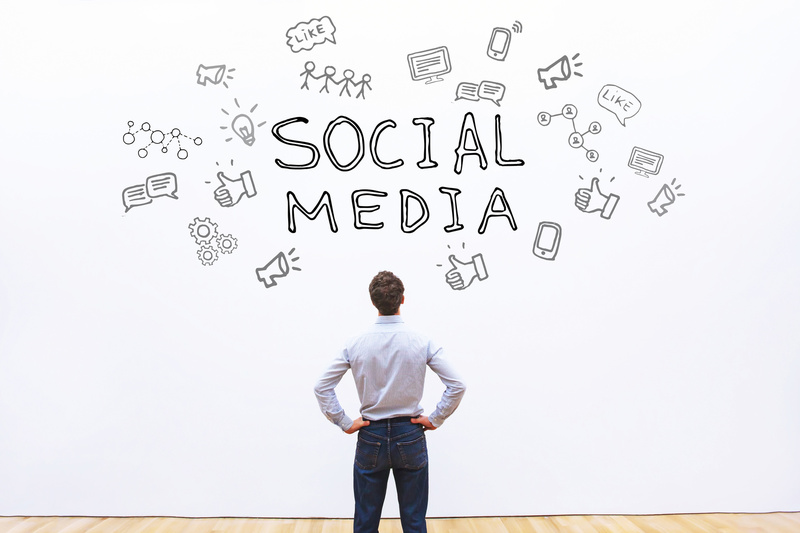 If you have an online business, you can use social media posts to drive traffic to your site. For instance, try linking to a new product or service you are offering, or regularly sharing new content such as blog posts. You can also use social media to drive traffic to your physical location. Post pictures of window displays, new merchandise—even candid shots of customers, who you can encourage to share their experiences on your social media pages. As we mentioned above, the majority of Americans are active on social media—but which platforms are they using most? Not every social platform is suitable for every business, so it’s important to consider the type of business you’re running, your audience, and where they are active before initiating your marketing efforts. Facebook: With over one billion monthly users, nearly all of whom visit the site daily, it’s wise to establish a presence on Facebook. Individuals are generally more active on Facebook than businesses, so this platform is best suited for B2C marketing. Twitter: Many users report feeling more connected to an SMB after following them on Twitter, so this is a good platform to enhance brand loyalty. It is also useful for B2B marketing and networking, as many businesses and industry influencers are active on Twitter. Pinterest: Being a niche platform, it’s easy to underestimate Pinterest’s value, but it is very effective at driving traffic. In fact, across the web, it comes second only to Facebook in generating website referral traffic. If your business involves food, fashion, fitness, travel, and crafts—anything with visual appeal—Pinterest will be a valuable platform for you. Instagram: Much like Pinterest, Instagram is powered by visuals, so if you’re a service-based business you may struggle to find relevance on this platform. However, it is a powerful tool for B2C marketing at the local level. Build your presence on Instagram if you are in the travel, retail, hospitality, health, or beauty industry. LinkedIn: Recently acquired by Microsoft, LinkedIn is rolling out updates to add additional value for its users, so it is a platform to keep an eye on. Currently, it plays a bigger role for B2B, being well suited for product launches, recruiting, lead generation, and content distribution. Google+: This platform may have fewer active users, but its community feature makes it easy to network with other businesses. Moreover, maintaining an active profile on G+ can help you rank better in Google search results, which is a reason in itself to build a presence there. While many businesses use social media to drive traffic and increase sales, it goes beyond your bottom line. An active social presence nowadays is crucial to enhancing brand loyalty and building trust with your customers. It is the most direct link they have to you, so the question is no longer whether you should be on social networking sites, but rather which platforms you should be using. Which social networking platforms does your business use?